Since 2014, our oceans have experienced terrible impacts from red tide and global coral bleaching which have caused global coral mortality events. Now, NOAA announced this week that a new menace has been discovered with high capacity for reef and entire ecosystem destruction. On Monday, July 25, 2016, divers discovered "green, hazy water," over East Flower Garden Bank in Gulf of Mexico. Usually, it is blue and mostly clear. 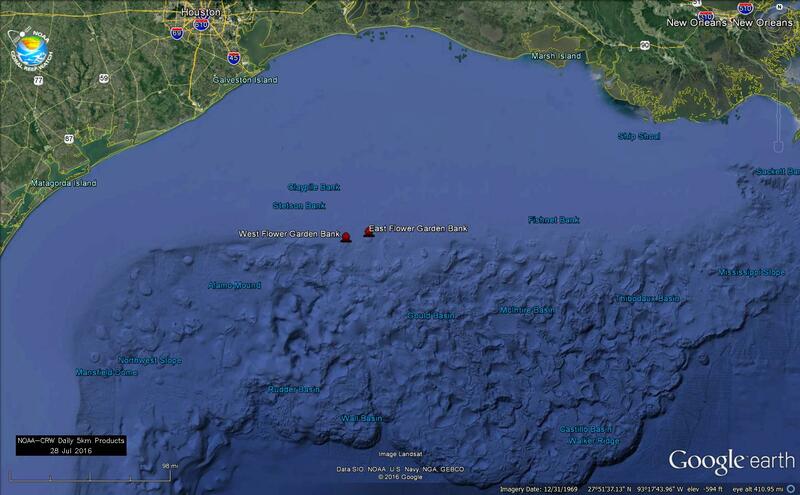 The Banks are about 100 miles off the Texas and Louisiana coast in the Gulf of Mexico. 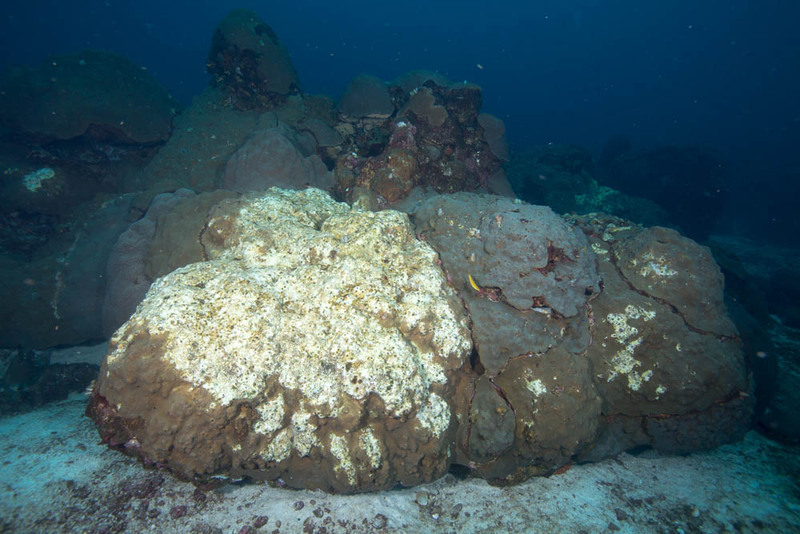 Arriving at the bottom they "were stunned to find ..... huge patches of ugly white mats coating corals and sponges, and dead animals littering the bottom on the East Flower Garden Bank, a reef normally filled with color and marine life. The reef, which is part of Flower Garden Banks National Marine Sanctuary, is considered one of the healthiest anywhere in the region." These photos are not isolated samples. According to Dr. Steve Gittings, NOAA's Chief Scientist of the Office of National Marine Sanctuaries, "The divers and researchers found unprecedented numbers of dying corals, sponges, sea urchins, brittle stars, clams and other invertebrates on large but separate patches of the reef. 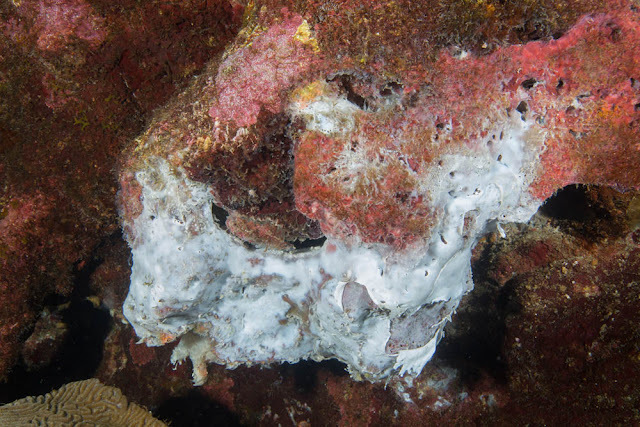 Sanctuary Research Coordinator Emma Hickerson reported extensive white mats covering corals and sponges, and estimates the mortality of corals to be nearly 50 percent in some of the affected areas. 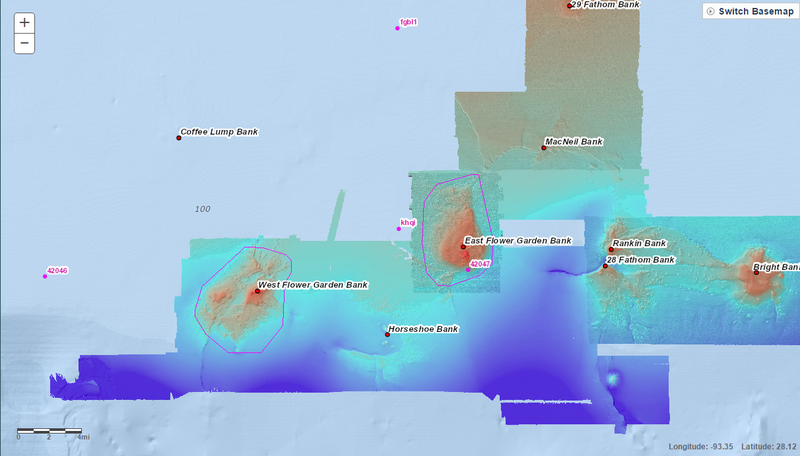 The spatial extent of the event is still being determined, but Hickerson says the die-off has so far been seen at three dive sites that charter boats typically use when they visit the bank." 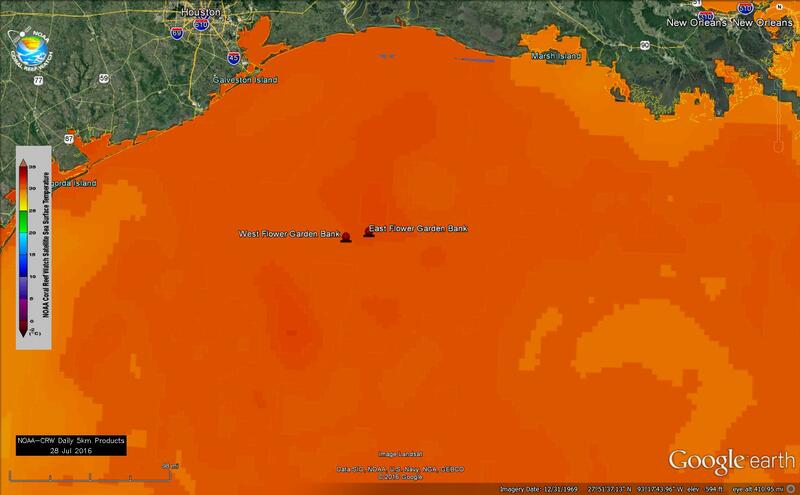 As NOLA, a New Orleans paper, summarized NOAA's statements, "The bank is undergoing a "large-scale mortality event of unknown cause." What is sad is that the East and West Flower Garden reefs have not previously experienced major coral bleaching or disease. 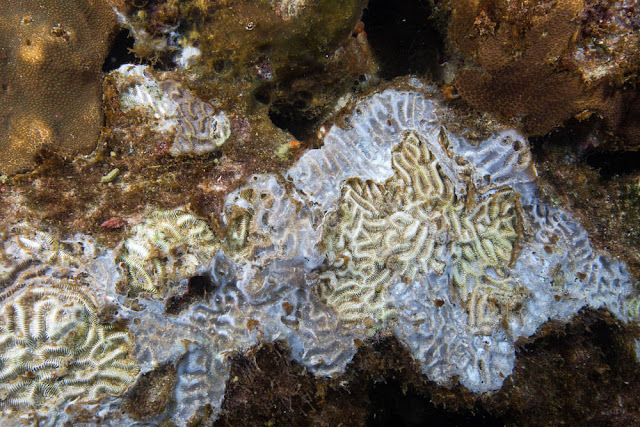 And, what is happening now is not coral bleaching, since more than corals are being affected. So what is known? First of regional water has been ranging from 29-31C for many days. The Coral Reef Watch sea surface temperatures for July 28, 2016 follow. 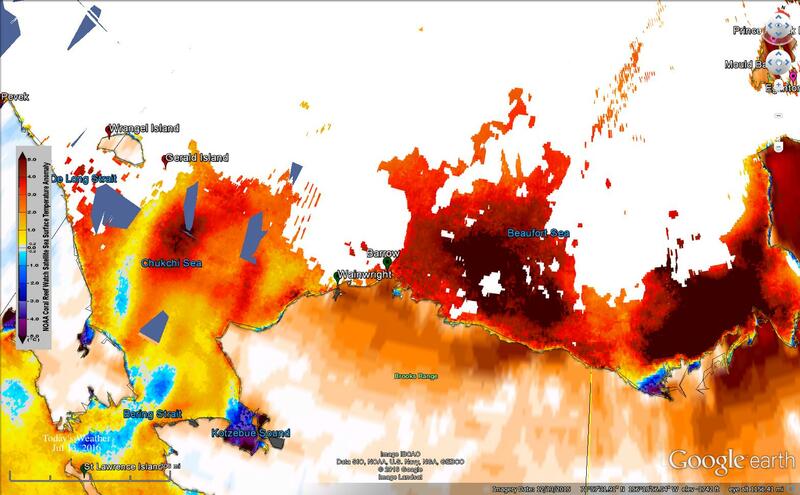 A recent SST from a local buoy was 31.0 C.
These SST's are 1-2 C higher than normal, causing concern that these reefs and others nearby may experience coral bleaching as the summer continues. 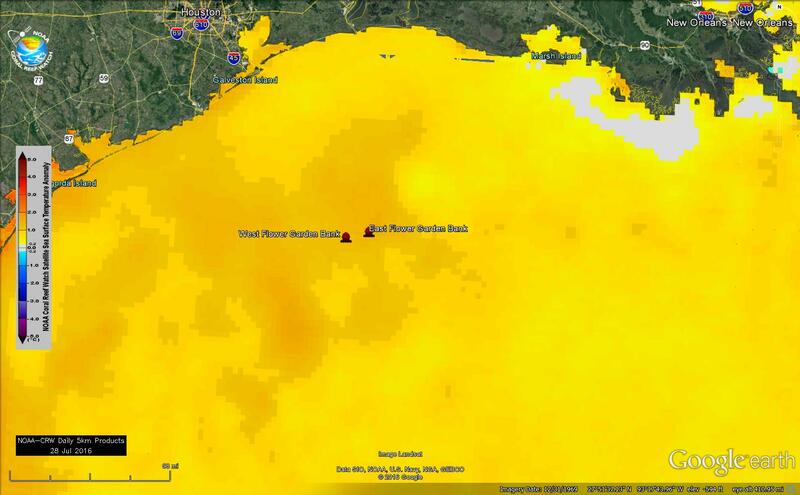 Also, NOAA's Coral Reef Watch has posted a bleaching warning for the East Flower Garden Bank reefs and others in this area of the Gulf this summer. According to G.P. Schmahl, the East Flower Gardens Bank Sanctuary Superintendent, ""We know of no spills that have recently occurred near the Flower Garden Banks." 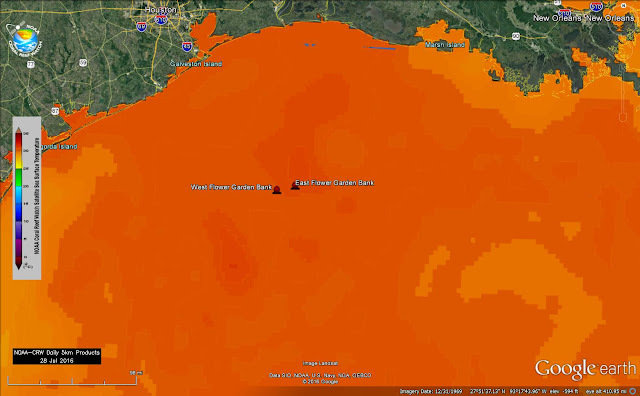 Dr. Gittings added, "In addition, large plumes of low-salinity coastal water have moved offshore following months of extreme rainfall in the region. That water is rich with plankton, nutrients and chemicals that arrive to the Gulf through runoff and river discharges. As the plumes decay, oxygen levels in the water can decrease." "Combined, these stressors could make coral reefs animals and plants more prone to disease outbreaks, or simply fuel the growth of bacterial or algae mats that smother the reefs. Scientists from around the world are offering advice and assistance in trying to help discover the cause." These reefs on the banks are somewhat isolated, which may have protected them from earlier human and natural impacts. But now they are succumbing to ... to what? As Gittings account ends, "The sanctuary and the science community are desperately trying to figure that out." So now, in addition to red tide, harmful algae bloom, coral bleaching, deoxygenation, and human run-off, we add "white matting" to the onslaught of coral reef decimation. 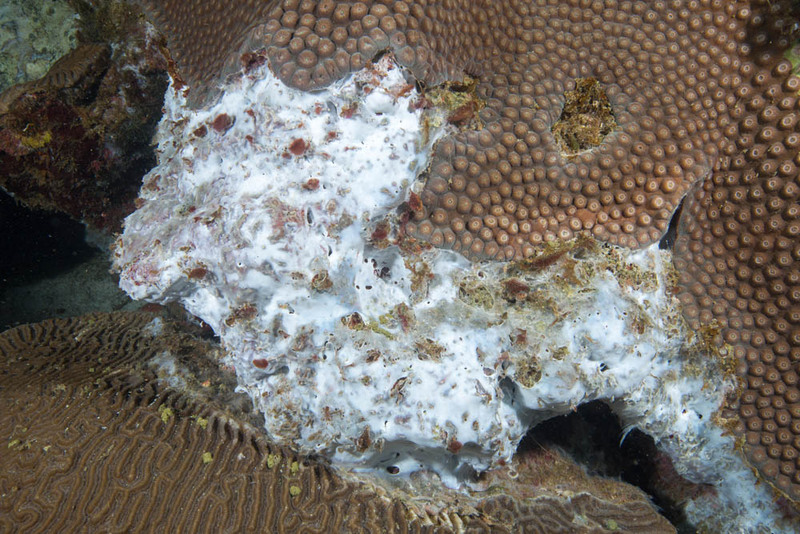 A deadly white mat coats a sponge between star and brain coral at the East Flower Garden Banks. Image credit: FGBNMS/G.P. Schmahl. Each month NOAA's National Centers for Environmental Information (NCEI) the former NCDC, releases latitude ranges of global land and sea surface temperature anomalies that help depict where global temperature variation is occurring on land and in the ocean. The monthly data covers January, 1880 through May, 2016. 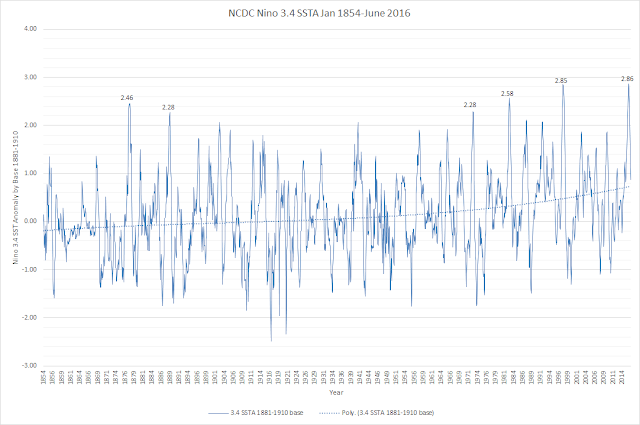 The anomalies are based on a 1971-2000 climatology, and thus the anomalies are higher than the current 1981-2010 anomalies generally publicized. 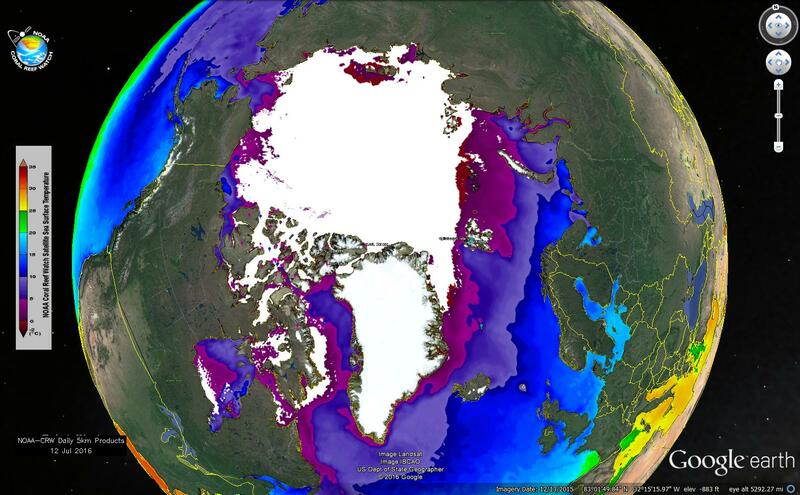 This posts demonstrates how Arctic Sea surface temperatures are changing global ocean heat and climate impacts. The anomalies are based on the ERSSTv4 data set, using the NCDC 1971-2000 base. First, here is the global ocean anomalies from 90S-90N, for Jan 1880-May 2016. The climb since the 1970's is obvious, and is impacted by increasing global warming caused by CO2 rise. 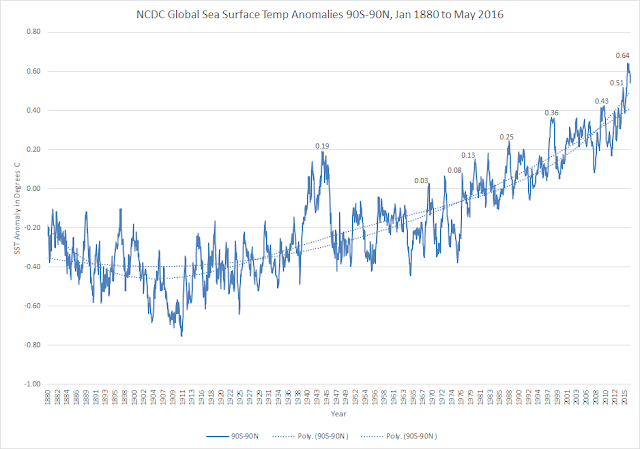 When we add the sea surface temperature anomalies by Northern and Southern Hemisphere, it is apparent that northern CO2 emissions have had a stronger impact on warming the Northern Hemisphere oceans. The NH SSTA's jumped considerably in 2014-2016, peaking at .95C above the 1971-2000 base - almost a "Moderate El Nino" in strength. The greatest contributor to the Northern Hemisphere SST anomaly has been warming in the Arctic, from 60-90N. While there is stronger variability month to month, overall, the Arctic warming is having a major impact on global ocean warming overall. Here is the monthly detail from 1950 to May, 2016. The blue line being the global SSTA, the red line the NH, and the green line revealing the jump in warming beginning to 2003 in 60-90N. 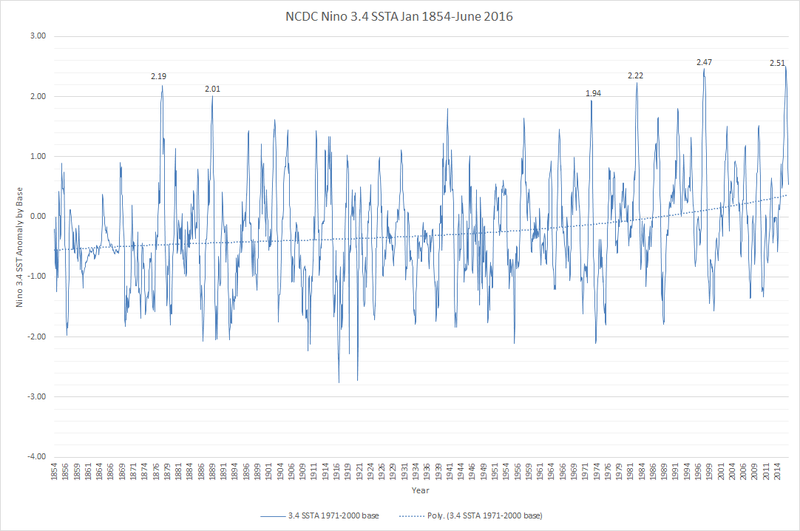 If the Arctic had a Nino scale, it would be in an almost constant El Nino state for the last several years. 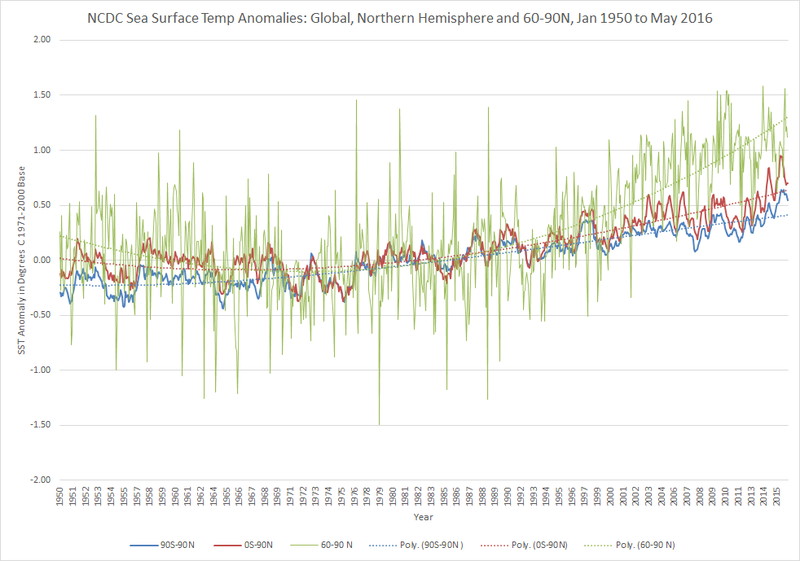 Since March, 2009, there has only been one month below .50 C.
So what does this warming look like mapped through time? Here is the 1880-May 2016 GISS TEMP data set visualization for ERSSTv4 SSTA with the 1971-2000 base. Anything orange, red or brown is basically an "El Nino" level of anomaly. 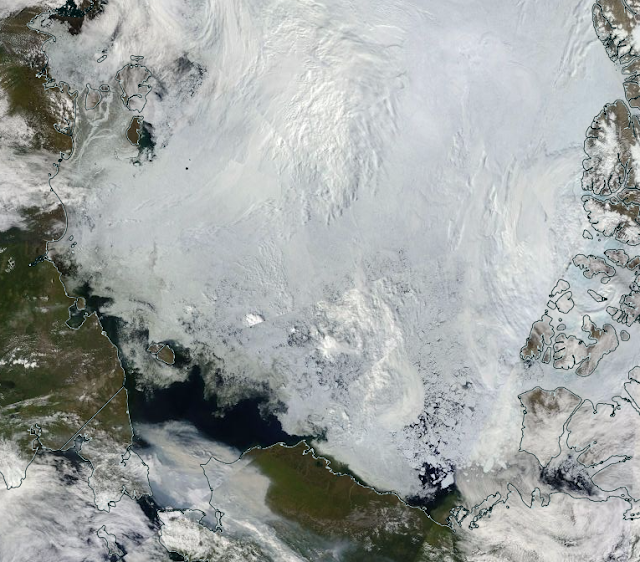 What the data reveals is clear compelling evidence of warming, much of it in the Arctic. It also reveals the "Global El Nino" We are now living with. Super El Nino Over? Perhaps Not. Base Periods Matter! In May-June, 2016, it was announced by various official climate agencies, organizations and media outlets that one of the strongest El Nino's recorded was "dead." For example, on April 11, 2016, the Washington Post's Angela Fritz, called the "Godzilla El Nino" dead. Washington Post: https://www.washingtonpost.com/news/capital-weather-gang/wp/2016/04/11/godzilla-el-nino-is-dead/ In reality, the Nino 3.4 SST's had only dropped below 1C, and it was not till the end of May that Australia's BOM called it over. Each of these SST anomalies are based upon the SST averages for the years 1981-2010, the current climatological base for determining ENSO SST anomaly values. 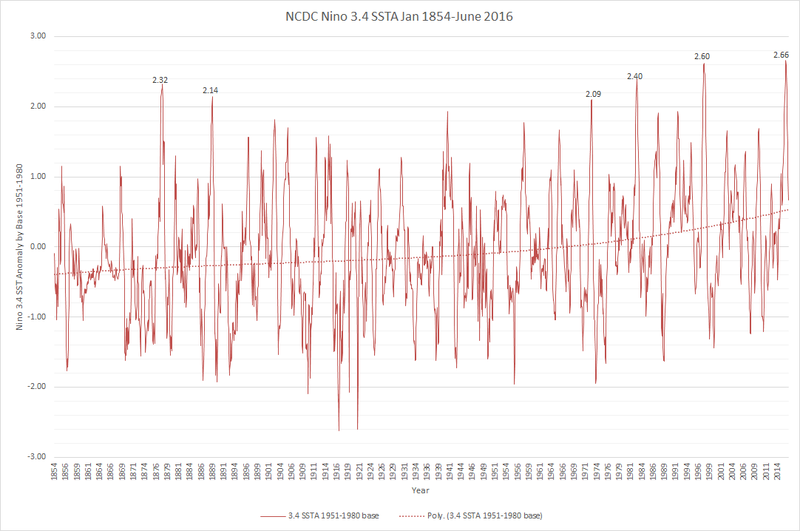 The science community consensus is to use a 30 year scale which slides every 5 years, to map an El Nino against the most recent observed climate. I understand the rationale and support it. However, the question that kept bugging me was....so how do these anomalies compare to actual Nino 3.4 sea surface temperatures over time? Fortunately the National Climate Data Center (NCDC), makes available the ERSSTv4 reconstructed and observed sea surface temperatures for the Nino regions from January, 1854 through the most recent month. 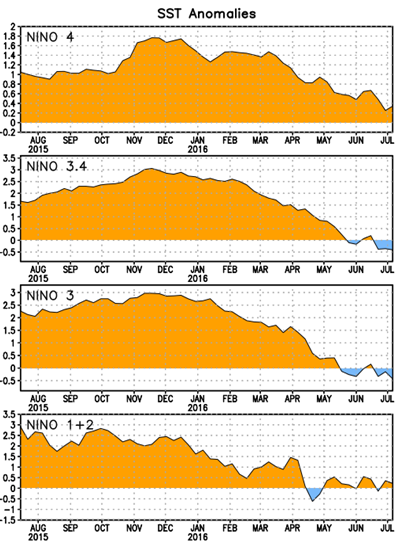 The basis for measuring El Nino/La Nina is warmth or coolness in what is called Nino 3.4, in the central Pacific. So how much difference is there between climatological base periods? There is an "El Nino" difference between 1854-1883 vs 1981-2010 and for many months in the 1881-1910 vs 1981-2010. Also El Ninos and La Ninas are rated by strength or severity based upon how strong they are. They are classified as Weak (with a 0.5 to 0.9 SST anomaly), Moderate (1.0 to 1.4), Strong (1.5 to 1.9) and Very Strong (≥ 2.0). No category has been officially created for SST anomalies above 2.5 C.
With these differences in mind, here is the impact of using the earlier base periods to create SST anomalies. 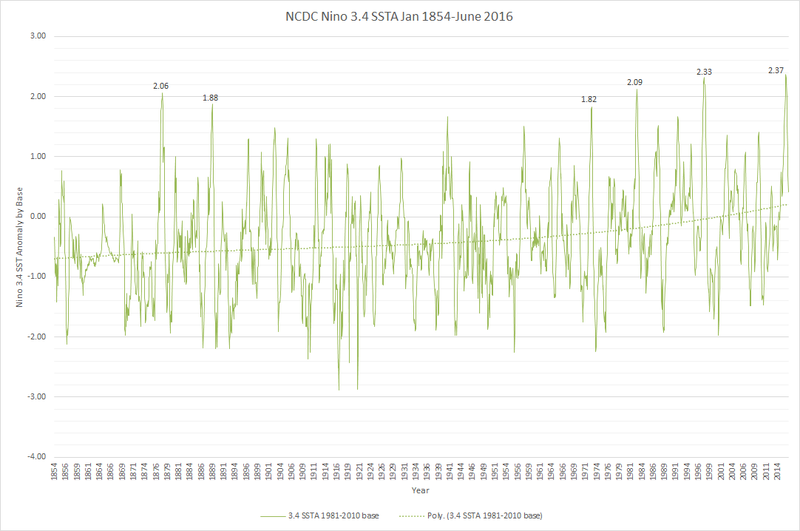 We'll work backwards through time to observe what happens to our current ENSO neutral, and the "Godzilla El Nino." 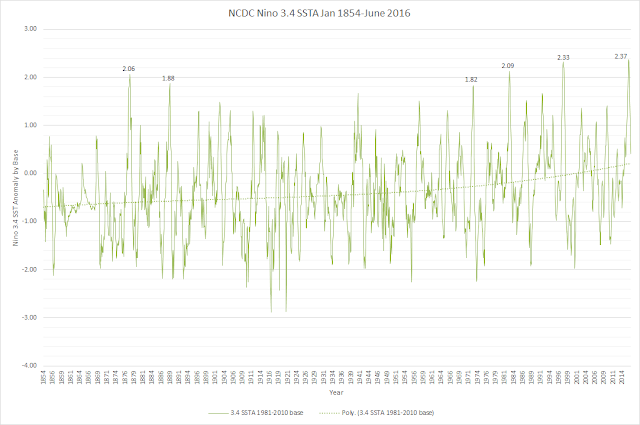 Here is the current monthly Nino 3.4 graph for January, 1854 through June, 2016, using the 1981-2010 base period. 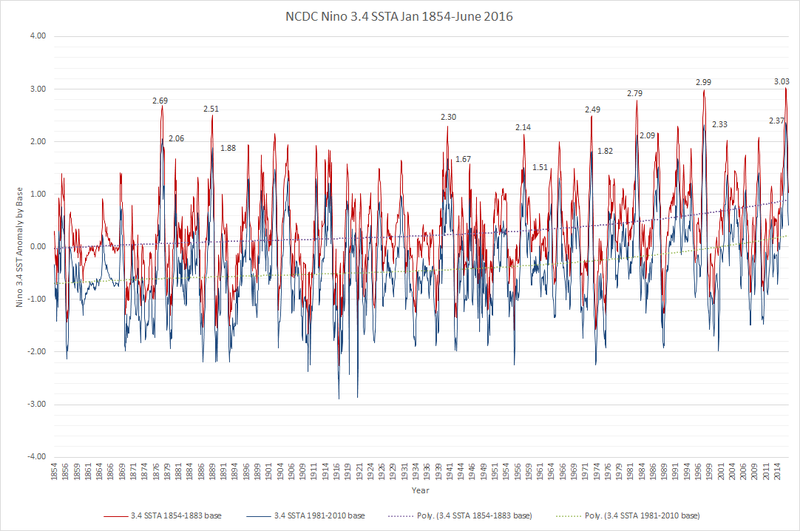 There are four very strong El Nino's, with anomalies above 2C: in 1887, 1982, 1997, and 2015. 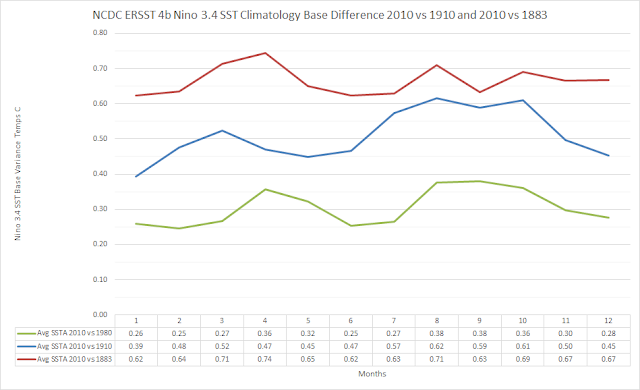 Each El Nino SSTA is stronger, with both 1997 and 2015 in the "Very Very Strong" (VVS) with a 2.66 C anomaly in November, 2015. We now have almost four "Very Very Strong" (VVS) El Nino events, 1877-1878 is almost there, along with 1983, 1997 and 2015. 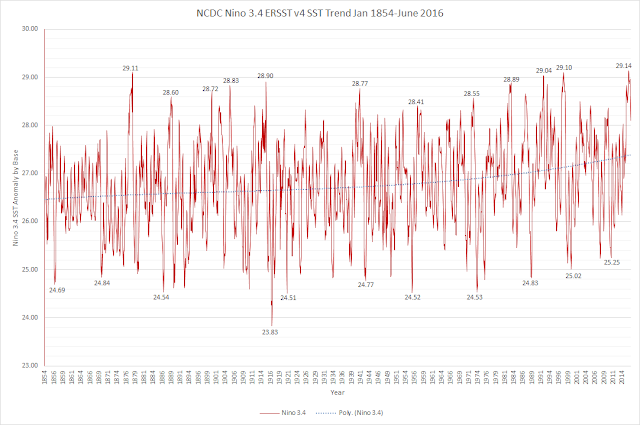 With 1997 at 2.85 C anomaly and 2015 at 2.86 C anomaly, we are close to needing new superlatives. 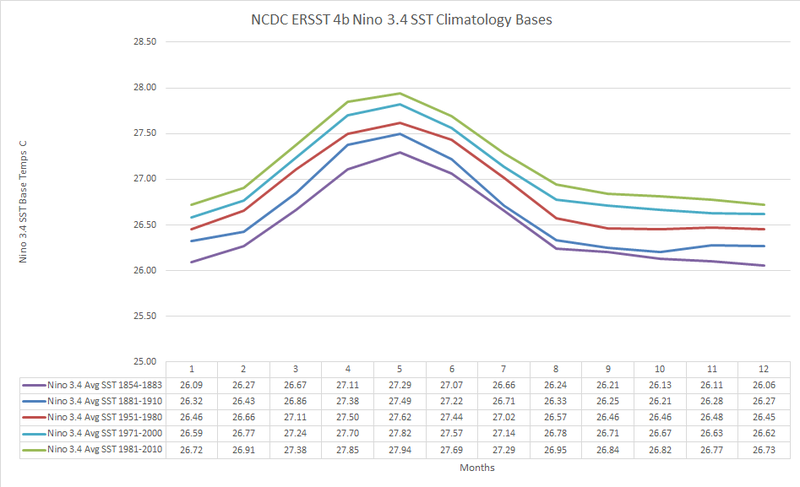 With this oldest available SST base, the power of these El Nino's becomes even more pronounced. 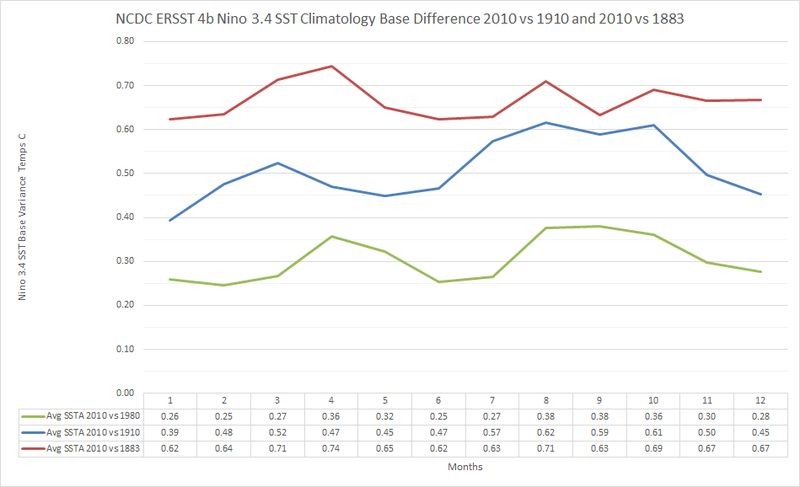 The 1878, 1889, 1972 and 1983 El Ninos are all "Very Very strong" (VVS) anomalies. 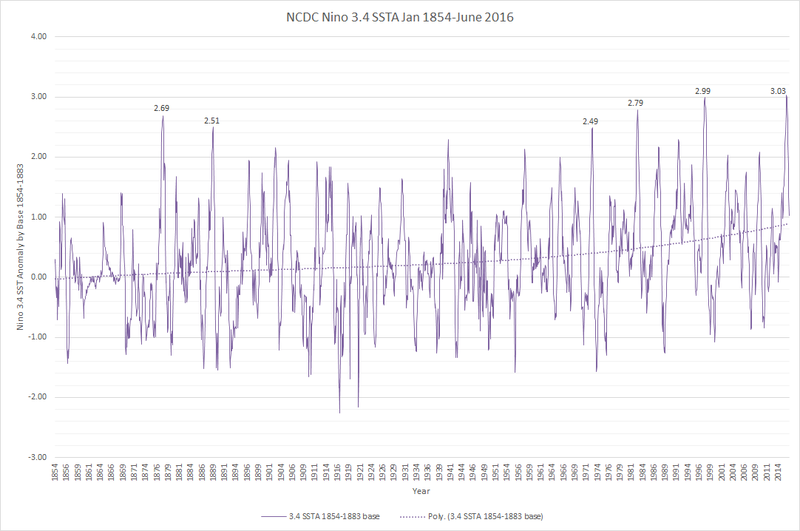 However, the 1997 and 2015 El Nino peaks deserve that new superlative - Godzilla El Ninos. Perhaps a "GZ" designation. 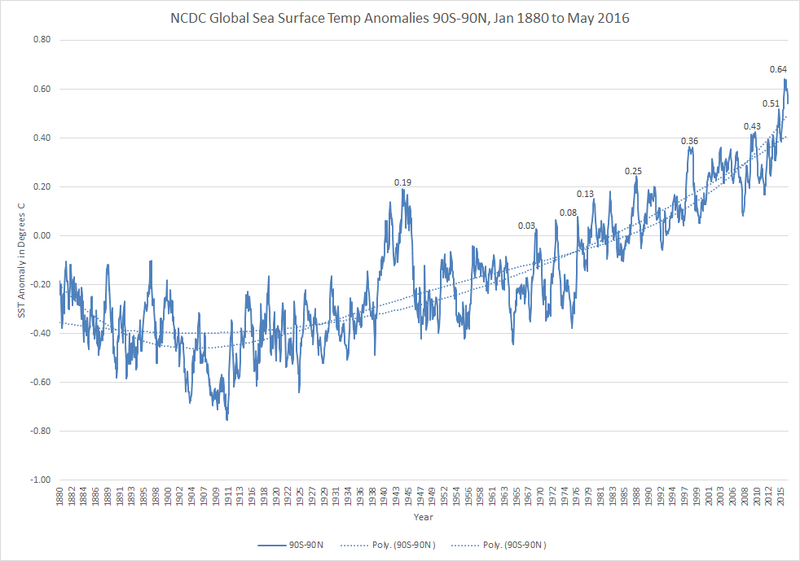 Sadly, if we keep increasing global heat content, we may have to find a scarier monster for naming SST anomalies above 3.5 C.
Source: NCDC data (link above). Graphics A4R. The SSTA numbers above the red peaks are the 1854-1883 base readings, those beside the peaks are the 1981-2010 SST anomalies. The difference is a "weak" El Nino in itself. 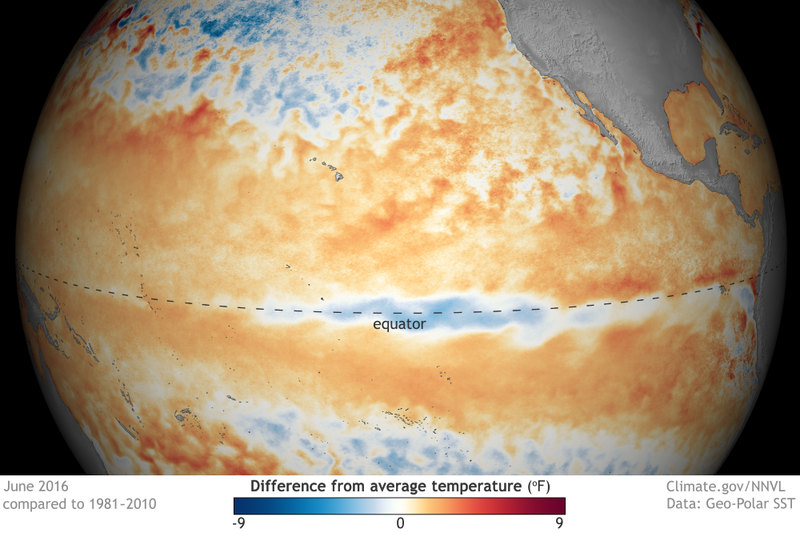 So what about the current El Nino not being over? 1981-2010: .41 C - ENSO neutral, as generally reported. 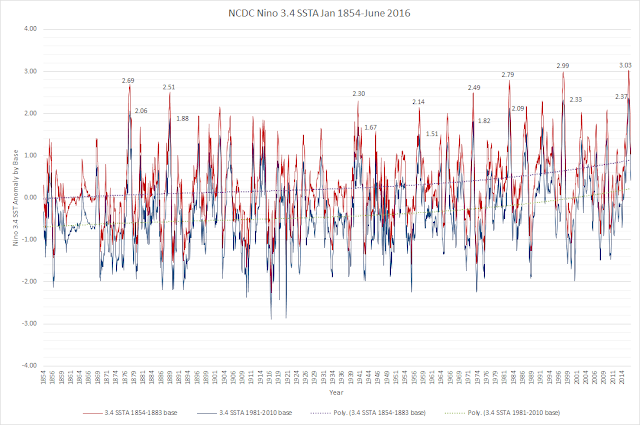 Given the above bases, El Nino is not over - even worse, we are in historical hot water - a "Global El Nino." 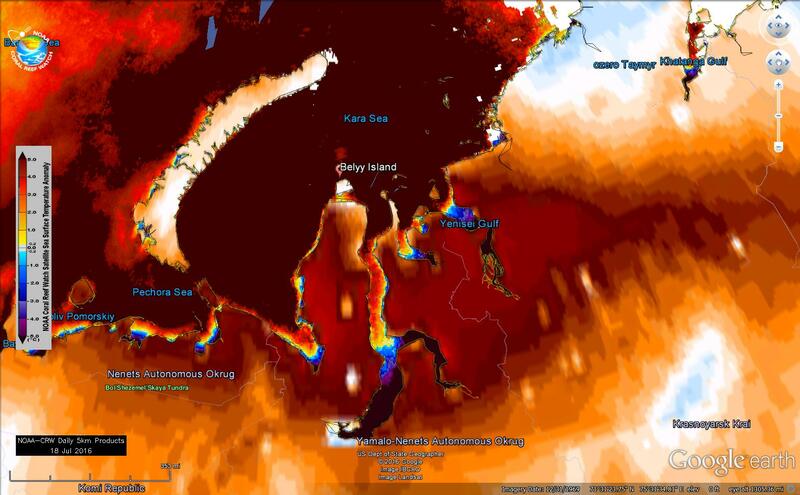 As we continue to watch the Arctic warm, air temperatures often catch our attention, but what matters even more to long term warming is the ocean heat content. Here are the Coral Reef Watch daily global sea surface temperatures at 5 km resolution for July 12, 2016 displayed in Google Earth. 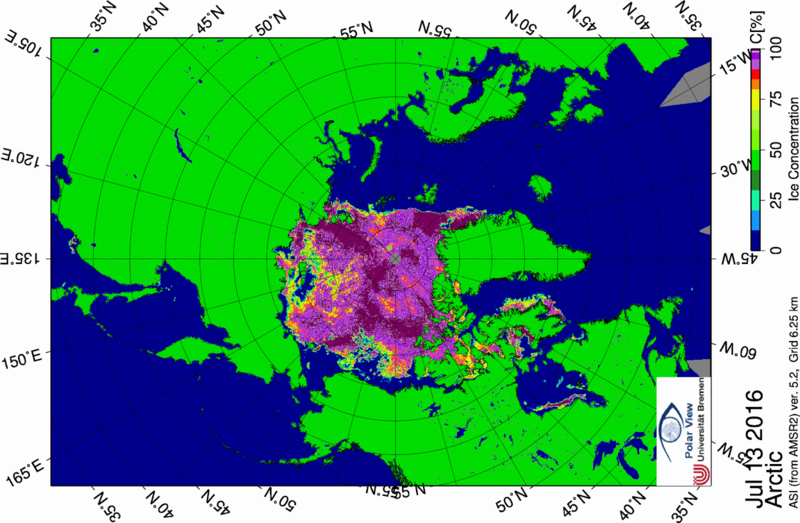 "The climatology used for CRW's new 5-km Geo-Polar Blended Night-only products was produced using night-only values for the 28-year period 1985-2012 from the 4-km Advanced Very High Resolution Radiometer (AVHRR) Pathfinder Version 5.2 SST (PFV5.2) data set, an official NOAA climate data record. 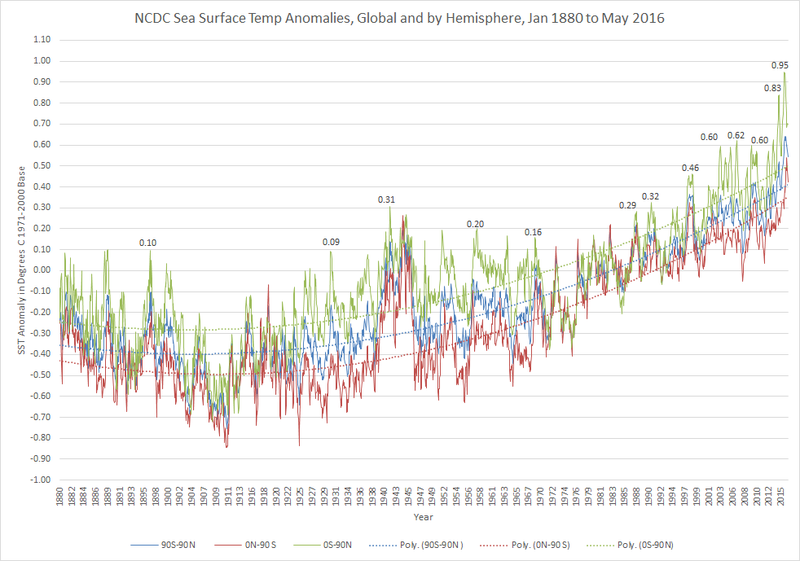 We used the 28-year period to produce 12 monthly mean climatologies. The 5-km climatological average values were bias-adjusted to match the 5-km SST data." So what's the anomaly for July 12, 2016? A lot of heated water..... in many areas more than 4C above the climatology. If one is wondering where the new global warming heat is going....it is in the Arctic waters. 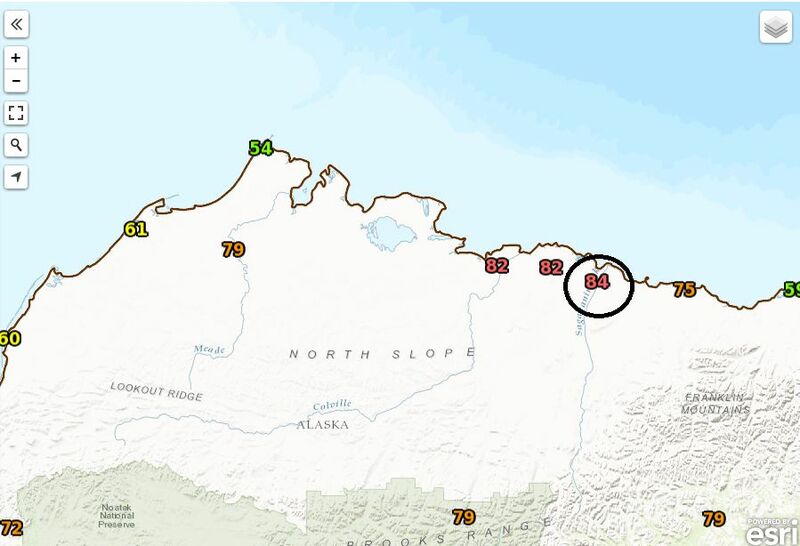 UPDATE: Deadhorse, AK just hit 85 F, at about 6:50 pm, July 13, 2016. Brian Brettschneider just posted an ERSI image of what he says is the warmest high temperature for the Alaska Arctic Coast - 84F at Deadhorse this afternoon. He says, "The new all-time record of 84°F at Deadhorse is also an AK record for any station within 50 miles of Arctic Ocean." What's crazy is that it is warmer there than in some Florida locations this afternoon and 3F warmer than my mid-America location! WINDS ARE EXPECTED MID MORNING FRIDAY. SYSTEM FOR ANY CHANGES TO THE EXPECTED IMPACTS AND TIMING. all with sea surface temperatures well above normal. 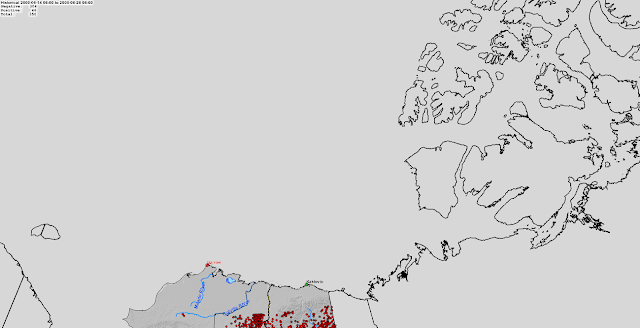 Areas in white represent sea ice presence, but with thin concentration. While there will be a "cold front", the impact on the ice will likely be a higher melt rate in the weeks to come. On July 8 and 9, 2016 the National Weather Service published special weather statements regarding the potential for thunderstorms in Barrow, Alaska and on the North Slope. There was not a thunderstorm reported in the media, although on July 10, 2016 there was a cloud to ground strike 15 miles from Barrow. Curious, I decided to research the background of Arctic Coast or Arctic Ocean thunderstorms, starting with Barrow and Wainwright, Alaska. Here's what I found, and what came at the end made my jaw drop in regard to lightning strikes and thunderstorms over the Arctic Sea Ice - and the massive changes in the last 16 years of increasing thunderstorm activity over the Arctic Ocean. 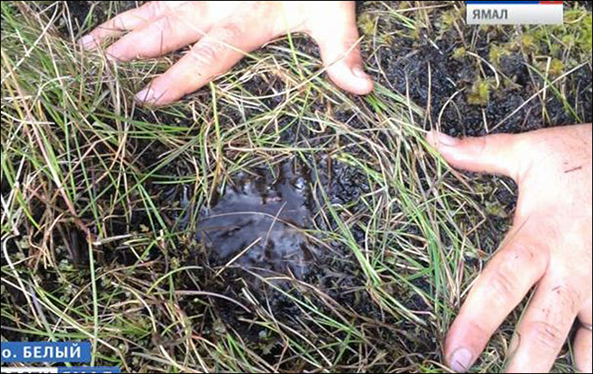 The NOAA Center for Environmental Information hosts the Alaska Climatological reports from 1915 to 2015. The following observations of thunder or thunderstorms come from those reports. July 8, 1921, Thunder was heard at Barrow, Alaska for the first time in many years. The prior event was not dated. July 3, 1931, Thunder was heard again in Barrow Alaska. 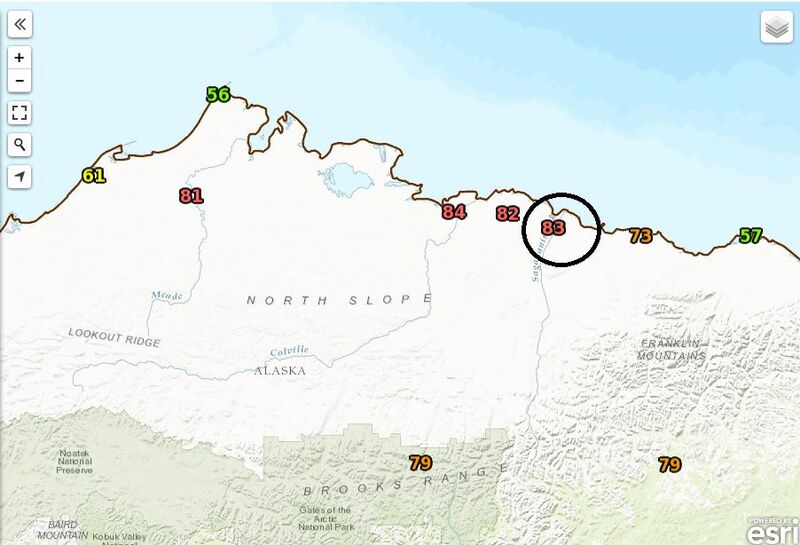 July 8 and 12, 1943: Thunderstorms occurred in Wainwright, Alaska, about 86 miles southwest of Barrow, on the Arctic Ocean, but no report from Barrow. July 16, 1950: Wainwright, AK observed a thunderstorm south of the weather station and the report states this is "the farthest north thunderstorm ever reported in the Alaskan Territory." July 4, 1952, Wainwright, AK again observed thunder. July 22, 1989, Finally, after many years, Barrow experienced thundershowers. July 18, 1995, Barrow, after six years, experienced thundershowers. June 20, 2000, Barrow had a thunderstorm that received international attention and was misrepresented as the first thunderstorm at Barrow in the most of the media. Thundershowers moved through Barrow, AK on the Arctic coast on the 20th. A rare event- a thunderstorm moved through the Barrow area on the 20th and dropped 0.16 inches of rain in just a couple minutes. Many calls were received at the weather office from people who have just witnessed their first thunderstorm and lightning display ..and what a display it was. According to calls received, Barrow had one of the most exciting events they had ever seen since it was the first for most residents. Thunderstorms and lightning are extremely rare on the north coast of Alaska. 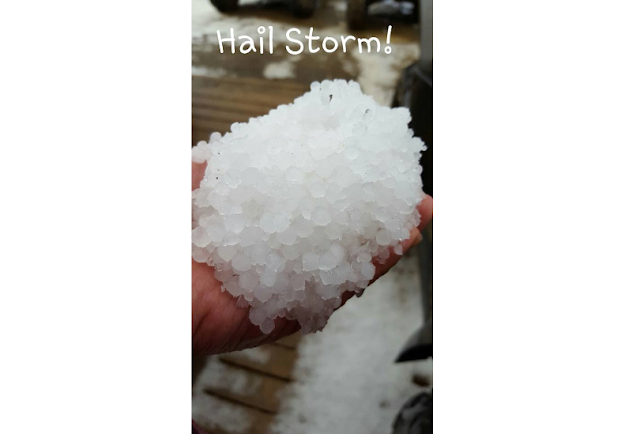 This is only the third time a thunderstorm has occurred in Barrow since 1978. The other two events were on July 18, 1995 and July 22, 1989. A 2012 article captured recollections of this event. It was recalled as "thunderclaps directly over Barrow in 2000 that sent dogs scurrying under beds and frightened children who had never seen a thunderstorm. On that day, rain poured heavily for a community that gets little of it, and phones lit up at the local National Weather Service office, with residents wanting to know what was going on. "It was early, early in the morning," recalled Dave Anderson, head meteorologist in the city of 4,400. "Everyone was in bed, and people got a little concerned." The Alaska Interagency Coordination Center strikes recorded during June and early July , 2000 are below, minus the Barrow storm strikes. A November 15, 2000 article by ABC titled Arctic Thunderstorms: New Signs of Warming, captured how unusual and concerning this new development was to Canadian Arctic communities. 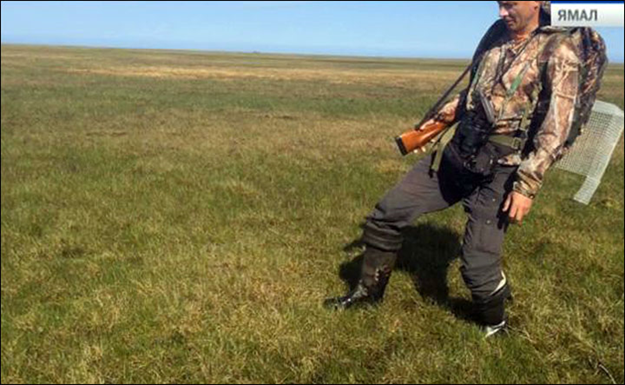 The study focused on knowledge among Inuits of changes in the Arctic environment. Researchers spent a year visiting Sachs Harbour on Banks Island in the Northwest Territories, accompanying Inuit people on their hunting and fishing trips and recording their observations. By 2001, Alaska installed lightning detectors on the Arctic Ocean at Barrow, giving us a more complete historical lightning record for the North Slope. June 28 to July 12, 2001, depicts more North Slope lightning and one single strike east-northeast of Barrow, over the ice - a premonition of what was to come. Each blue line is a lightning strike. 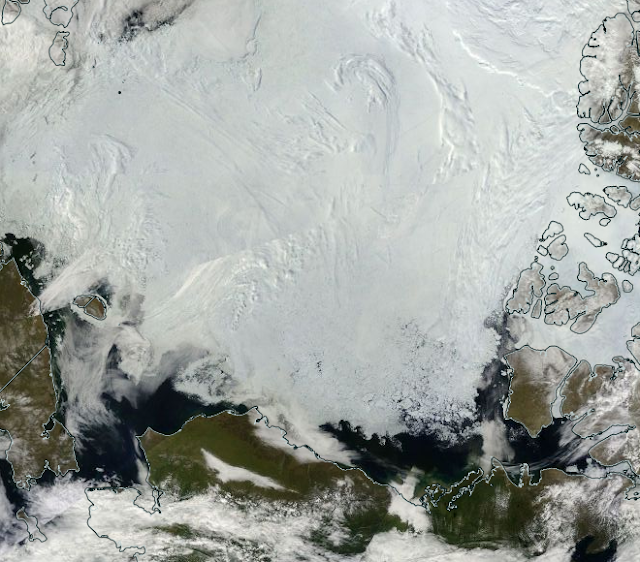 June 28 to July 12, 2002, reveals almost no strikes north of the Brooks Range, and none in the Arctic Ocean. June 28 to July 12, 2003, depicts dramatic change with thunderstorms producing hundreds of lightning strikes within a hundred miles of shore off the Alaskan coast. June 28 to July 12, 2004, brings the next reports of a thunderstorm on July 3rd at Barrow, with strikes across the Alaskan North Slope and into the coastal Arctic Ocean. 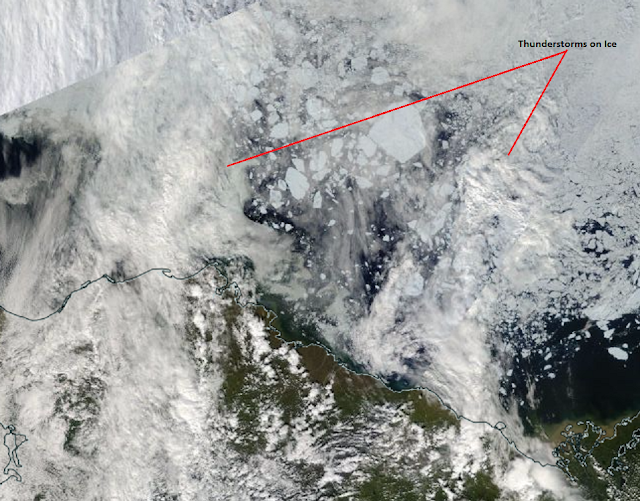 June 28 to July 12, 2005, reveals a return to minimal North Slope lightning or thunderstorm activity. June 28 to July 12, 2006, returned to the "old" normal of the past, of few lightning strikes or thunderstorms north of the Brooks Range. June 28 to July 12, 2007, saw a continuation of the "old" normal, with few strikes or convection activity on the North Slope, and none in the Arctic Ocean. June 28 to July 12, 2008, revealed the first resurgence of lightning in the Arctic Ocean, and more thunderstorm activity on the North Slope, perhaps an initial link to heating and sea ice loss. June 28 to July 12, 2009, is a return to the historical pattern, with no lightning activity in Arctic Ocean for these dates. 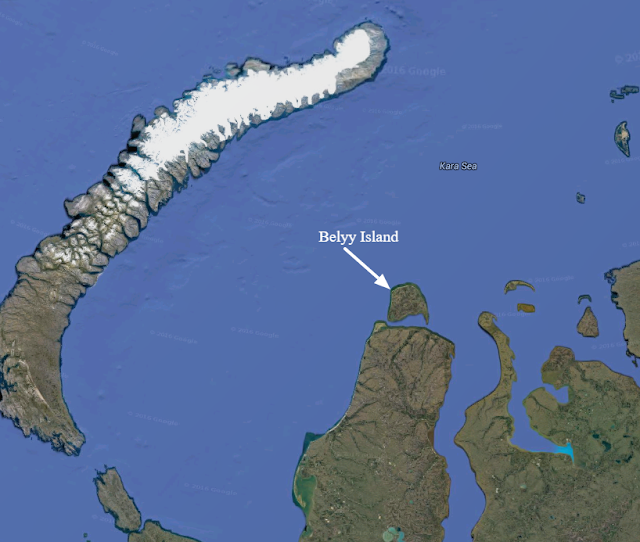 June 28 to July 12, 2010, preserves the past, except for a few strikes off the eastern Alaska coast. June 28 to July 12, 2011, is quieter than the prior year, except for two strikes in the Arctic Ocean, not far from the Alaskan coast. The first sign of the future of lightning storm convection over Arctic sea ice is apparent in the June 16 to 30, 2012 image. The path of lightning strikes goes heavy and deep over open Arctic Ocean, then the ice pack. June 28 to July 12, 2012, saw a muted repeat of the 2000 and 2004 events. The expansion and replacement of the Alaska lightning detection network in July, 2012, brought in the capacity to measure more lightning strikes, and included Arctic Canada for the first time. A LINE OF THUNDERSTORMS DEVELOPED JUST EAST OF BARROW LATE THIS AFTERNOON. A FEW RUMBLES OF THUNDER WERE HEARD AT THE NATIONAL WEATHER SERVICE OFFICE IN BARROW BETWEEN 515PM AND 535PM. THE ALASKA FIRE SERVICES LIGHTNING DETECTION NETWORK RECORDED FEW STRIKES JUST SOUTHEAST OF DEASE INLET. THIS IS THE FIRST THUNDERSTORM AT BARROW SINCE JULY 3RD 2004. Dave Anderson, the Barrow meterologist, said, "rain cloaked the lightning so flashes couldn't be seen very well, Anderson said. But lightning strikes were recorded about 30 miles southeast of Barrow over Dease Inlet, according to the Alaska Fire Services Lightning Detection Network. The noise was faint. "My wife and I were at home," said Anderson. "We could barely hear the thunder." Another local resident, Jana Harcharek, said that she'd only seen lightning twice from Barrow, where she's lived her entire life. "It's rather bizarre," said Harcharek, who refused to share her age. "Rather than running in, we're running outside to see it." One sobering note. The high temperature that day. It was 65 F in Barrow, warmer than Anchorage! June 28 to July 12, 2013, brings more activity over the Arctic Ocean, with strikes as far out as 73N over 150 miles from shore. June 28 to July 12, 2014, continues the pattern of increasing North Slope and Arctic Ocean strikes with further concentration over areas with low ice ocean. 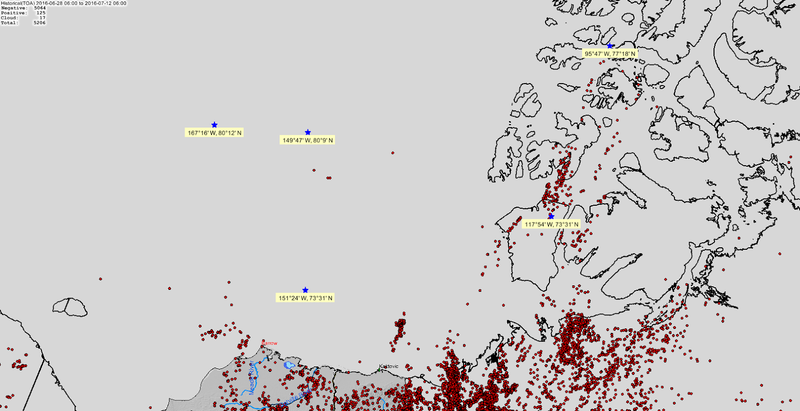 Much of the lightning activity was over open water as the sea ice melted. 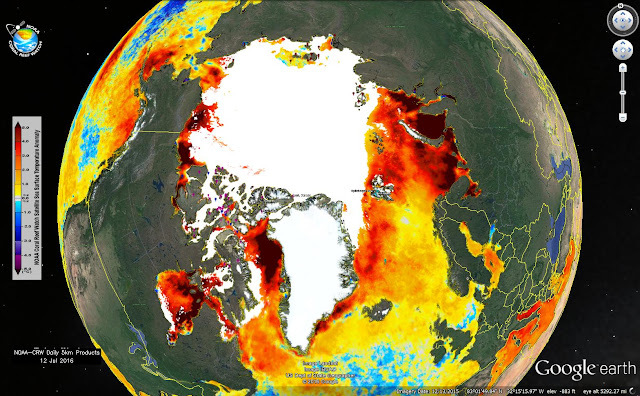 The EOSDIS, Worldview July 9, 2014 image helps visualize the Arctic melt and storm relationship. June 28 to July 12, 2015, represents the first major shift in the Arctic Ocean paradigm, with lightning strikes ending up in places unimaginable in 2000. A whole cluster of thunderstorms penetrated deep into the ice pack, all the way to 80N. It can be surmised that the storms contributed to ice pack movement and fracture. EOSDIS Worldview July 5, 2015, the clouds over the Central Arctic Basin were the lightning producing storm. 2016's Arctic heating and ice pack state has contributed to increased storms over the region. Here is how the lightning and thunderstorm season has unfolded. 2016's lightning season started on the North Slope - in May. 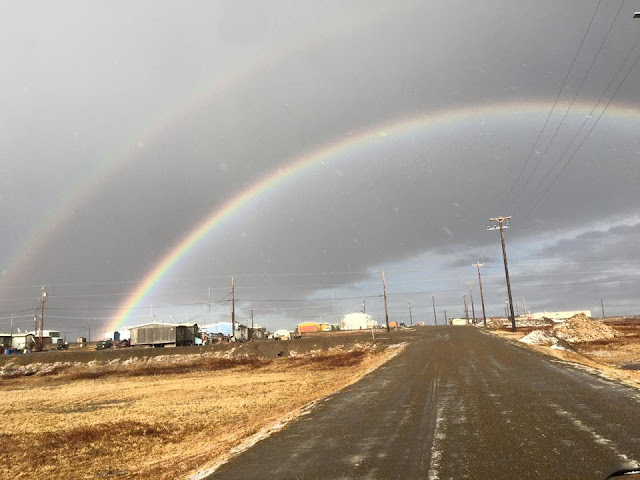 In Atqasuk, an Inupiaq village 60 miles south of Barrow, they experienced a hail storm followed by thunder (cloud to cloud lightning - no ground strike), and a double rainbow. (Note the hail on the road). This was on May 25th! June 1-14, 2016 reflected the waves of heat and thunderstorms that penetrated the Canadian Arctic, setting off the Ft. McMurray and other fires. 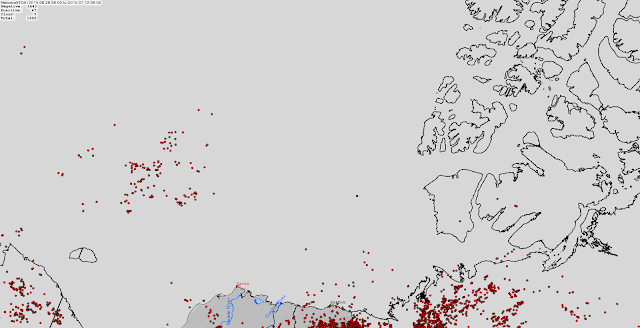 June 15-29, 2016 reveals an explosion of lightning activity across Alaskan North Slope, unmatched by prior years data, and the falreup of storm activity over the Russian Arctic and Canadian Arctic. The map of June 28 to July 12, 2016 brings this to a somber conclusion - the Arctic lightning detection maps begin to reveal thunderstorms penetrating where lightning has never been seen - thunder never heard, with the ice pack being pelted with rain in ever heavier amounts. We are seeing lightning strikes at 80N, 625 miles into the Arctic Ocean icepack from Barrow. Part of our changing climate that humanity has not seen previously -and cannot change. The July 10, 2016 EOSDIS View gives a glimpse of warmth streaming into the Arctic Ocean, bringing thunderstorm impacts not yet modeled. 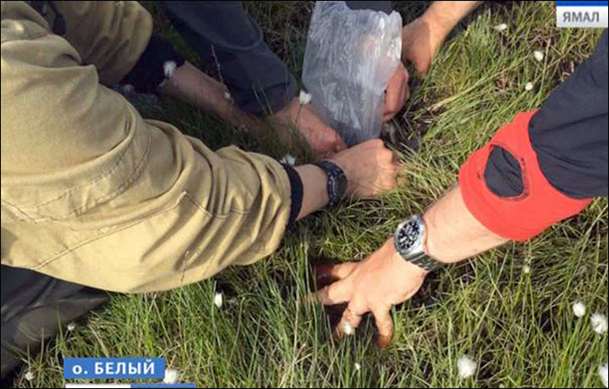 What the impacts will be more tundra lightning, perhaps faster melt - time will tell. June 28-July 12, 2012: The "Transition"